Chemical engineers invent, develop and design processes that convert raw materials into useful products - with minimal environmental impact. Chemical engineers are also involved with pollution control, protection of the environment and with energy conservation. As populations grow and resources and energy reserves decline, the demand for chemical engineers increases. As a chemical engineer, you can work in a range of industries including the biotechnology, chemical, energy, environmental, food, mineral, nanotechnology, oil, paper, petrochemical and pharmaceutical industries. Process engineer - you solve production problems, develop new products, reduce energy usage and the carbon footprint, increase plant safety and efficiency, and oversee plant upgrades and expansions. You work with a team of people in operations, maintenance and business strategy. Design engineer - you work in a consultancy office, designing new plants for clients, as well as extensions to existing plants. You might design a distillation column today, be sizing a heat exchanger tomorrow, work on safety and environmental protections, or work out how to control each unit of the plant to ensure smooth and reliable operation. Research and development engineer - you work in a laboratory or a company, and develop new ways to do chemical engineering. You might develop new products or you might work on new catalysts to increase reaction efficiency. 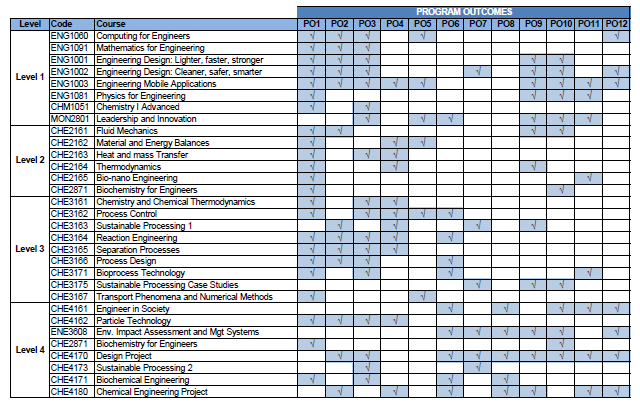 The Chemical Engineering discipline has developed a set of Program Outcomes (POs) for all of its graduates based on the competencies required by the Malaysian Engineering Accreditation Council. Design/Development of Solutions: Design solutions for complex Chemical Engineering problems and design systems, components or processes that meet specified needs. Research-based Investigation: Conduct investigations of complex Chemical Engineering problems using research-based knowledge and research methods including design of experiments, analysis and interpretation of data, and synthesis of information to provide valid conclusions. The Bachelor of Chemical Engineering (Hons) is accredited by the Malaysian Qualifications Agency (MQA), Engineers Accreditation Council (EAC) and the Engineers Australia Accreditation Board. See here for more information.